Combining rice and beans is a direct track to Nicki’s heart. I love the combination of rice and beans. Brown, White, Yellow, Mexican, Spanish, Dirty – almost any kind of rice combined with a variety of beans – Black, Pinto, Red, Refried – is a sure winner. It is almost a sure bet that at least one meal that I make during the week, will include rice and beans. Every so often, I get to enjoy some of my favorite rice and beans ever. The best Homemade Mexican Love creation ever. Since I am Half-Mexican, I get the privilege and honor of eating homemade Mexican fare every time we visit family in Ft. Myers. Besides the amazing homemade tortillas, my absolute favorite is the Rice and Beans. Oh my gosh. These are my true Mexican Love. A gift from the gods. Every time I get the chance to eat these, I really go to town. Forget one or two servings…I normally opt for 3. (Okay, sometimes I stop at 2 but, that is only if the party includes tons of people). Let’s begin with the rice. Mmm. The rice is traditional Mexican rice and is cooked low and slow. The rice is then served to us in a Crock Pot which keeps the rice warm but not smoking hot. I love the fact that the rice is warm rather than too hot. The warm rice allows all of the flavors in the rice to be present in their brightest form. I can taste flavors of tomatoes, salt, a variety of peppers, garlic, onion, cilantro and love. The rice is so soft and tender…it melts in your mouth. The consistency of the rice isn’t sticky like Cuban rice normally is. Rather, each piece is its own being. The rice is neither dry nor overcooked – the benefit of cooking things low and slow the right way. The cooking method allows each individual piece of rice to just be full of flavor. Every bite of rice provides a smooth texture and taste that fills your mouth with love. 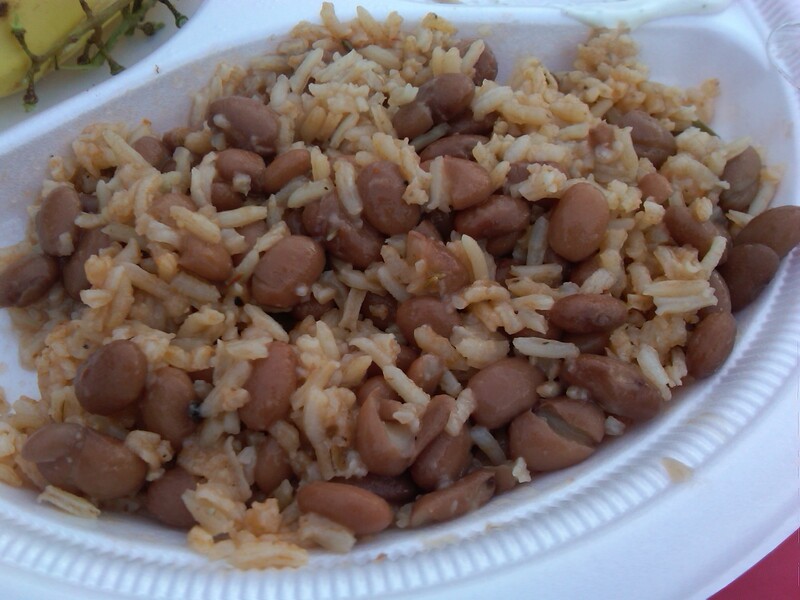 While the rice is so amazing on its own, it becomes even better with the addition of Pinto Beans. And these are not pinto beans you get out of a can. No way. None of that. These are pinto beans that are homemade. Dry beans are cooked with a variety of seasonings in a large metal pot on the stove. These beans cook for hours and the aroma fills the house. Scooping these beans out from the metal pot is one of my favorite steps of the process. I first scoop out my rice from the Crock Pot and then apply a large helping of beans on top of the rice. Once I arrive to my seat, I combine the rice and the beans. Every bite includes adequate amounts of rice and beans. The beans are so soft and tender but not to the point of being mushy. No extra flavoring or seasoning is needed – the rice and beans produce it all. The beans are slightly warmer in temperature than the rice which provides your mouth with two semi different temperatures – neither of which is too hot. Every bite of these rice and beans is delicious. Each and every morsel of rice and every last bean. Amazing. This is a prime case of how much better food is when it is cooked in a homemade fashion. Gone is the overly salty, sodium tasting junk you buy from the store and in is the perfectly seasoned Mexican Love. While the parties are loads of fun – especially since I discovered, and consequently fell in love with, Chalupa – there is just something about the food that makes the day for me. The homemade salsa is fabulous but hands down, there is nothing like the homemade rice and beans. 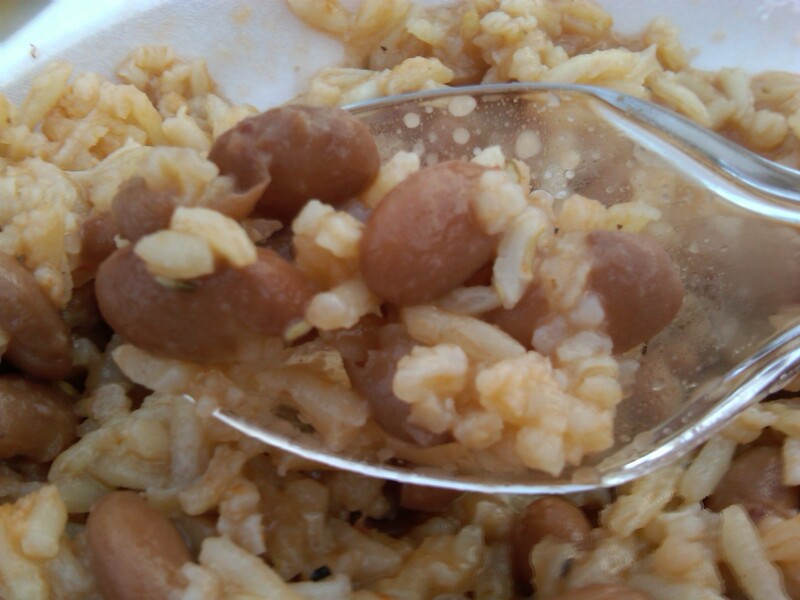 Perfectly flavored & textured rice combined with tender pinto beans win their way into my heart and stomach. These are truly the Homemade Mexican Love that hold a special place in my heart.